Fold the mirrors back and retract the antenna before washing the vehicle. Brushes used in automatic car washes may scratch the vehicle surface and harm your vehicle’s paint. Rear spoiler (if equipped) may not be washable in some automatic car washes. There may also be an increased risk of damage to vehicle. Before car wash, check that the fuel filler door is closed. Remove any dirt immediately by using a neutral detergent. Do not use hard brushes or abrasive cleaners. Do not use strong or harsh chemical cleaners. Use the same mild detergent and wax as used on the paint. Set the wiper switch to off. If the wiper switch is in “AUTO”, the wipers may operate unexpectedly in the following situations, and may result in hands being caught or other serious injuries and cause damage to the wiper blades. Do not apply wax on the surface of the lights. Turn off the wiper switch. 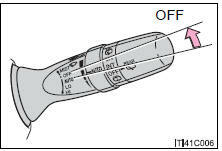 If the wiper switch is in “AUTO”, the wipers may operate and the wiper blades may be damaged.